Extra heavy duty that's easy to adjust. With a 10", 6 lb. low-profile base, the MS9210 is an excellent choice for any handheld microphone. 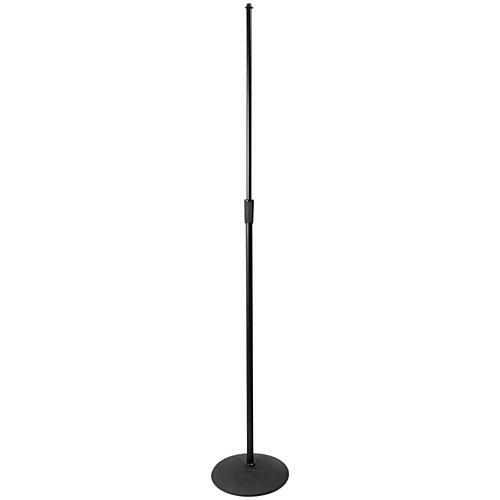 It is well suited as a lead vocal/soloist stand, and its smaller 10" base makes it perfect for backing vocals, a cappella, and other closely grouped applications. Its steel shafts measure 7/8 and 5/8 in diameter like most common portable stands, but its heavy-duty mid-point clutch is extraordinarily robust. The clutch is designed to act as a brake on the upper shaft, even when loosened, preventing the shaft from crashing down while adjusting height. To aid with precise mic positioning, the upper shaft features an oversized knurled locking washer that keeps any attached mic clip exactly where desired. Connection of the lower shaft to the base is via a solid steal machined lug with M20 threading and locking washer. This course threading provides an excellent combination of fast assembly and secure connection, while extending thread wear far beyond fine-thread designs. Finally, superior stability is achieved thanks to a sleek, embossed base with shock-absorbing rubber pads. Grab a stand that you can rely on. Order today.